Long bond rates delined this week (YAAAY!!) but since short rates remained flattish, the yield curve flattened (BOOOO!!). Personal income and spending data from February intimates a weak Q1 GDP report, but doesn't suggest any imminent downturn. Real retail sales have pulled back from their autumn surge, and real personal spending has also declined slightly from its last peak in December. But we've had similar small drawbacks before, as in early 2012 and early 2014 without it portending anything horrible. 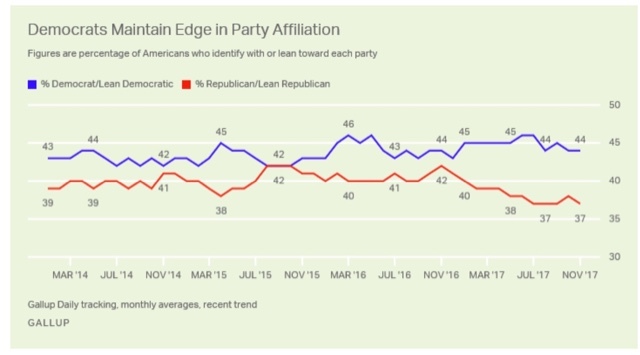 This metric tends to have a steep decline, as it did in 2016, sometime around the middle to late middle of an expansion. 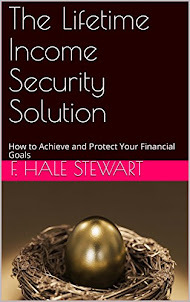 While a subsequent upturn in savings does occur in the advent of recessions, the data is too noisy to say anything concrete. Almost certainly it was the autumn spurt in spending (possibly related to hurricanes and the fires in California) that was the outlier, rather than the subsequent several months. BUT, note that the YoY% change in both has declined sharply in advance of the last several recessions. We don't see that at all now. Real personal spending growth continues at roughly a 2.5% annual pace, and real retail sales growth at a 1.5% pace. While this is the umpteenth confirmation that we are later in the cycle, only if we see a deceleration to nearly or less than 0% change in YoY retail sales would I become concerned about any imminent downturn. I have updates on several recent posts, on my long term 2018 forecast, and whether the "economic season" is changing, over at XE.com. An initial note: this is a pretty slow news week. I do plan on a housing roundup over at XE, and if something looks especially interesting in the personal income and spending report, I'll comment. Aside from that, expect sparse posting from me. But because I am a curmudgeon, and the scourge of DOOOMERs, herewith a dissection of a post I read this morning that had me shaking my head. In December, as Mish highlights, the value of the index was +2.7. But beginning a year ago in January, it has *also* been 2.7 or even less in 8 of 12 months. So, by his own standard, shouldn't a "recession have been close" a full year ago? Did I miss the "Recession of 2017" or something? No such sharp deceleration here. Pretty much muddling along at +.2 or +.3. Not spectacular, but not suggesting any big dip in the next few months. 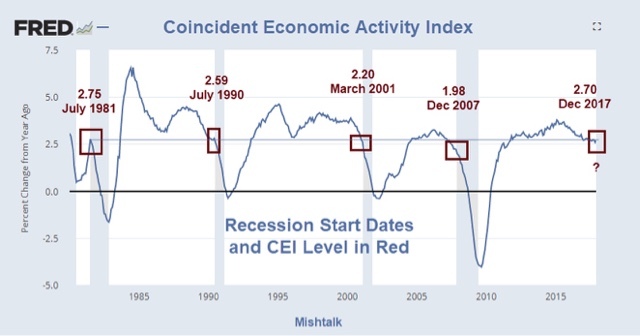 The most positive value of the Leading Index in the month before any of the last 3 recessions was +0.57, so I've subtracted that in the graph above. Note that the leading index is well above that level now. Housing starts, after a decline in mid 2017, in the last five months have risen to their previous highs from late 2016-early 2017, so they give him no help either. You're not going to get any help from people who flit from data series to data series in support of the same old thesis, only to forget about them when the data goes the other way. 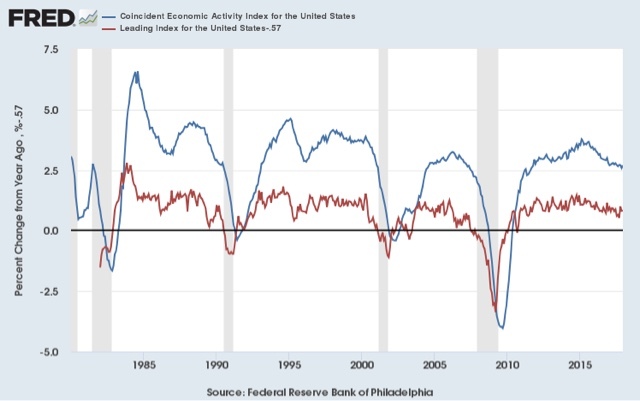 While every economic cycle is a little different, and political decisions can throw a monkey wrench into the works at any time, left to its own devices there's simply no evidence that the economy is close to a recession now or will be in one before the end of this year. 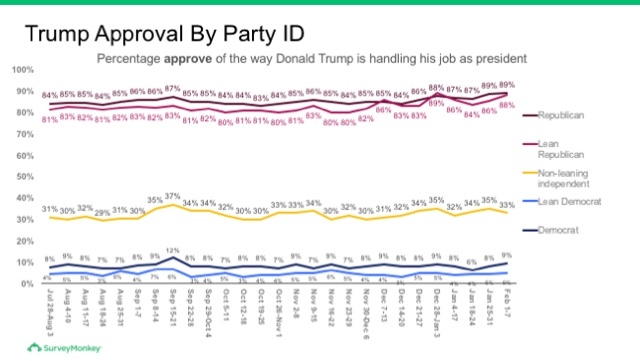 This is mind-numbing, especially when you consider the ad hoc contortions of morality that are involved in excusing all of Trump's personal behavior to have such uniform approval. But are white evangelical Protestants irredeemable? Because religious affiliation is voluntary (unlike, say, race or age), I think the numbers tell a different story. 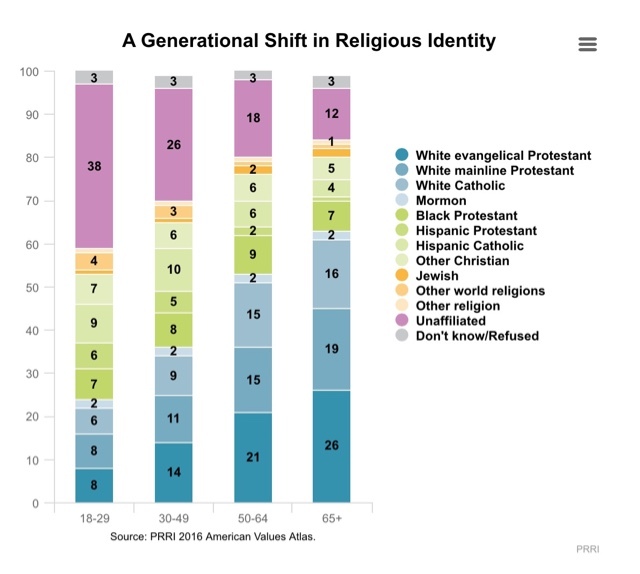 Look at the collapse in the percentage of whites who identify as evangelical Protestants by age group! Over a quarter (26%) of people over age 65 so identified, but that drops by more than 2/3's (to 8%) among adults under age 30. While some of that is the differing racial makeup of the two age groups, it is nevertheless breathtaking. While undoubtedly the passing of the tax cut for billionaires has brought some of the country club set back into line, the GOP's reactionary radicalism is driving some away, leaving the true believers behind. Keep that in mind when you read some of these studies: when voluntary associations move towards becoming purer, they usually also become smaller. BTW: one demographic statistic I have not seen in any of the many studies over the last year is approval ratings by age *controlled for education. * Over the last 70 years, higher percentages of Americans have had at least some college education. Having their beliefs challenged in college appears to be one important factor in younger people abandoning biblical fundamentalism. It may be, for example, that members of the Silent Generation with college degrees hold opinions pretty close to those of Millennials with college degrees. I have written the Pew Foundation to ask if that data is available, but haven't heard back.